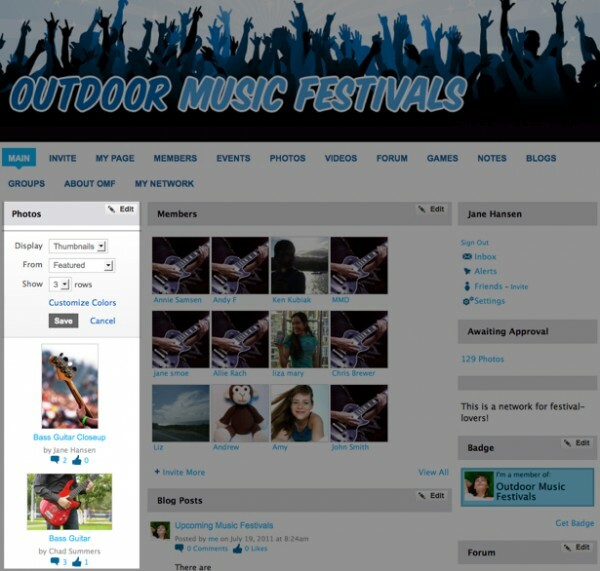 You can use the “Feature” option to showcase content and members on your main page. A featured photo, for example, will appear above all the other photos at the top of the Photos page. Featured content will also appear at the top of theÂ main page for that section, if the photos module is set to display featured content. 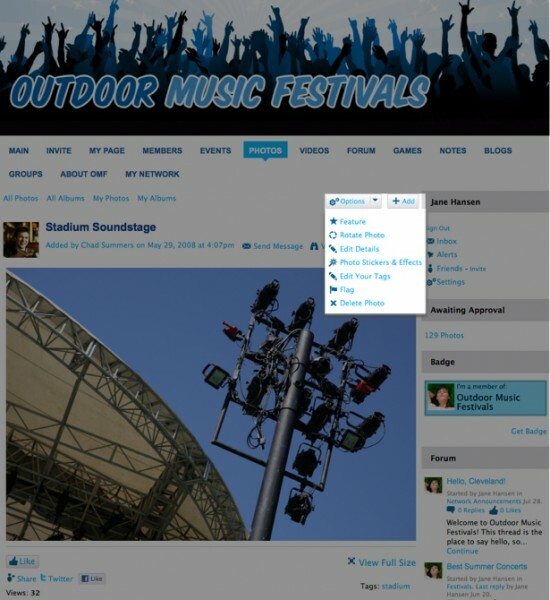 You can feature Blog Posts, Forum Discussions, Videos, Photos, Events, Notes and Members. To feature a photo, go to the Photos tab. Click on the photo you wish to feature and open up the photo’s detail page. Click on the “Feature” link just beneath the photo. To have the photo appear on your main page, go to your main page’s Photos module. Select “Featured” from the From drop-down menu. Now, this photo and any other featured photos will be displayed on your network’s main page. To feature forum discussions, blog posts, notes and events, follow these same steps and you’ll be all set! To feature a member, go to the member’sÂ profile page and click on the “Feature” link that appears in the column beneath their profile photo. To feature a song posted by a member on the main page of your network, go to the member’s My Page, click on the arrow button in their Music Player and select “Feature”. Then go to your main page Music Player and click “Edit”. From the Play drop-down menu, select “Featured” and save your changes. Now the songs that people see on the main page will be any that you have featured by other members on the network. Not seeing anyÂ “Feature” link? This member has likely set their profile page to be visible to “Just My Friends” or “Members”. Only members with fully public profile pages will have this option available on their profile page.